Memorial Day weekend is sure shaping up to be all about cheap 4G smartphones. First we had word out of Amazon that prices on all of their 4G phones would be slashed, and now we’re getting word that Verizon may be holding one of their own. 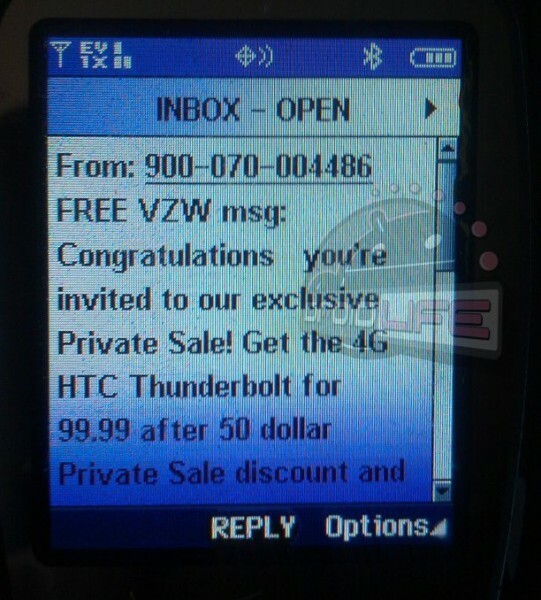 According to the text message received by one of our readers, certain customers are getting invites to an “exclusive Private Sale!” where they can pick up an HTC Thunderbolt for as little as $99. Hello, steal. We’re pretty sure this sale won’t be open to just anyone and is likely for those with upgrades available, but this may be worth checking your account over. We know that Verizon is holding a variety of regional sales, some of which will get customers up to $50 off of any phone, but this one looks to be combining a few. You’ll remember that this phone normally retails in Verizon stores for $249, so at half the price, you may want to see what kinds of negotiating skills you have.